La Serena Spa gift vouchers are available by calling 441-239-0184 or by clicking below. 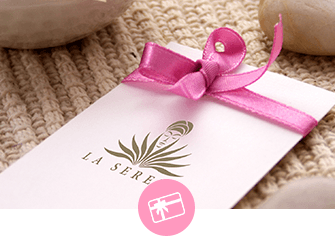 Gift vouchers purchased at La Serena Spa at The Reefs can only be redeemed at our location. Gift vouchers purchased from A.S. Cooper Main Store in Hamilton can be redeemed at both locations. The Reefs is proud to have a strong team of talented and experienced therapists to serve you at La Serena Spa. Each brings a unique quality to provide the best treatment and technique for your personalized needs. Favorite thing about La Serena: The ambience and the view it's a great place for our guests to relax. And ELEMIS, I absolutely love the brand and being able to introduce guests to the amazing facials and homecare. Favorite product & Service: BIOTEC, after training in London in October at the ELEMIS training academy I fell in love with this treatment and product line, the amazing technologies give phenomenal results yet the ELEMIS protocols mean that you still experience hands on touch for the ultimate facial experience. Elemis Aromastones – it’s a very healing treatment with the combination of the warmth of the stones, the stone placements and essential oils. Instant Refreshing Gel – it’s a miracle worker! Instant relieve for tight tired muscles great for travelling and swollen ankles in pregnancy. 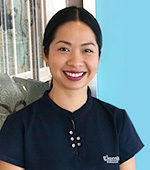 Traditional Thai Massage, Sports Massage, Deep Tissue Massage, Reflexology, Swedish Massage, Prenatal Thai Traditional Care, Reiki Master, Traditional Ayurvedic Treatments. Aching Muscle Body Balm for her guests with high levels of stress and tension, Frangipani and Lime and Ginger Slat Scrubs for beautiful soft skin! Thai Massage, Abhyanga & Shirodhara Ayurvedic Treatments. Favorite thing about La Serena Express? 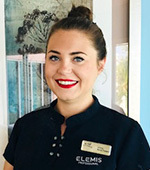 Offering amazing Elemis facials that deliver results in just 30 minutes and working with world renowned Bliss wax for the best and most gentle waxing experiences. How long have you been part of La Serena's team? 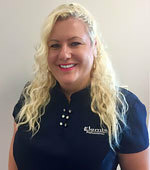 I worked at La Serena Spa for 2 years starting in 2011 and returned to open La Serena Express Spa in 2013. What do you bring to La Serena (ideas, skills, treatments)? Knowledge of the Elemis product line. I trained in England with the creator of Elemis, Noella Gabreil in 1994. 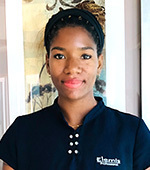 I owned an Elemis salon in the UK for 14 years and I am experienced in advanced waxing techniques and skin care. How long have you been part of La Serena’s team? Favorite thing about La Serena? I adore the Frangipani Oil its very suited to Bermuda as we have so many Frangipani Flowers here and I love how versatile it is, great for hair and body it has an amazing aroma! I love the Shankara Harmonizing Treatment it leaves you feeling wonderfully balanced as well as relaxed. 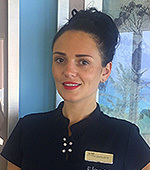 I bring my experiences from years of working in different spa’s across the world on a 5 star cruise line. The Relaxation Lounge really makes you feel as if you are away from the rest of the world and the view puts me and the guests at ease. Superfood Facial Oil is an amazing skin treatment that quenches the skin and feeds it with amazing anti oxidants derived from plant based superfoods! I am passionate about what I do and know that it shows in the way I work with my guests. Within the next year I hope to focus on studying to expand my knowledge. Bamboo Massage is a great for melting tension, also super relaxing and soothing. I love Pedicures! The Spa’s relaxing atmosphere and good colleagues, it’s like a family. A wealth of knowledge and experience from the medical field; physical therapy clinics, athletic and sports therapy centers and rehabilitation orientated facilities. Treating people with everyday complaints to competitive athletes I perform a thorough consultation to identify the chief complaint, tailor the treatment and provide an effective treatment plan, perhaps incorporating Shock Wave and Laser Therapy to have you back in tip top shape in no time at all. And of course if you just need to relax I have a wealth of spa experience too either way you are in good hands. Medical Massage people, it is so rewarding to treat any one experiencing on going pain and discomfort. I have the latest technologies to treat many injuries and ailments such as: Sprains and strains, Tendinitis Carpal Tunnel, Ligament & Tendon Injuries, Frozen Shoulder, Chronic back & Neck Pain, Plantar Fasciitis Rheumatoid Arthritis. I will be introducing Osteopathic Treatments in September 2016. I love treating guests for clinical/medical services, it is a really unique experience for the guest, they can choose to have the full spa experience of receiving a locker with a robe and slipper for their use, our saunas and the beautiful lounge it sure beats visiting a regular clinic. 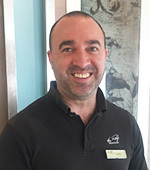 Thomas is the only Dr. of manual Osteopathy working in a spa environment in Bermuda, we were the first and only Spa here on island to offer Medical Services with Shock Wave and Laser Therapy – majority of my treatments are eligible for insurance claims which is even more of a perk when choosing medical services at La Serena Spa. Osteopathy treats chronic pain, both Chiropractic and Physical Therapy treatments “borrow” form Osteopathy due to its effectiveness, therefore any condition or problem that you visit your Chiro or Physical Therapist office for you can come to La Serena instead! Consultations are complimentary, so if you would prefer to discuss your concerns and treatment plan prior to booking a service that is fine too. 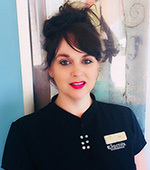 IHBC City & Guilds Diploma in Beauty Therapy further education in, Aromatherapy & Reflexology and many brands including: Most recently Elemis & Elemis BIOTEC technology, but also Shankara, Germaine D Cappicino, Piori. 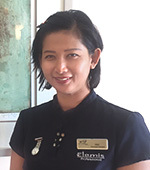 Enjoys the beauty and energy of the spa, also the highly skilled team that she works with. Shankara! Especially the Ayurvedic Facial with the Shirodhara treatment it is the ultimate Spa Experience. My love for all healing aspects of therapy and passion for Chinese medicine which helps keep me grounded and generates good energy for all of my massages. I love Reflexology and the new Ayurvedic treatments to awaken clarity, health & Spiritual awareness.